Since I have not seen very much regarding this company, as a place to rent motorcycles, let me start one. My wife and I are planning on riding from Barcelona to Austria and back. We have decided to use Rent a Tiger as our rental company. We are renting two "lowered" Tiger 800XCs for approximately 24 days. So far, we are very impressed with Rent a Tiger and it's owner Anton Alabau. 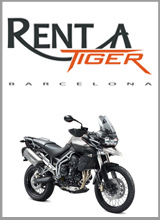 Anton, owner of Rent a Tiger, in Barcelona, has been so very helpful. He has made the process so much more comfortable than we had expected. Although we are planning this trip for the coming months, Anton has already given us better service and advice than we could have ever hoped for. So, I am starting this to let all the members of the forum know what a good company this has been so far. Granted, we have not gone on the trip yet, but if anyone is "planning" a trip, out of, or around, Spain, this is certainly a company to consider. I will, of course, post the results of our trip later. We are excited to do our first motorcycle tour of Europe (we drove a Smart Car the last time...... ho hum.... although beautiful... it was a boring "cage" drive) We can harly wait to get on the Tigers and tour the wonders of Western Europe. It is 50 degrees (F) and sunny, in Albuquerque, NM right now. We hope to "bring" some of the sunshine with us to Europe. We are going to Austria, but, unfortunately we will miss Tridays. Me and 4 mates will be at Tridays again this year, we will be getting into Newchurch on Friday Aft/evening on our way back up after doing Italy, Croatia and Sovenia, see you there. Thank you very much for your words Kern, I really appreciate it. I'll do my best to guarantee you two an unforgettable vacation. You'll have great bikes , brand new tires, and a few countries ahead to be discovered, each of them with different habits and culture. I bet you won't be bored riding our Babylon. It was a great experience, we loved the Tridays' atmosphere. We are not going to Neukirchen this year, as we must stay in Barcelona attending reservations, which is not bad at all. Safe trip to Austria!! Have a couple of for us.